Caudalie have recently released their first ever range of face masks which is exciting news indeed! There are currently four different ones to choose from and I've been loving these two so far. 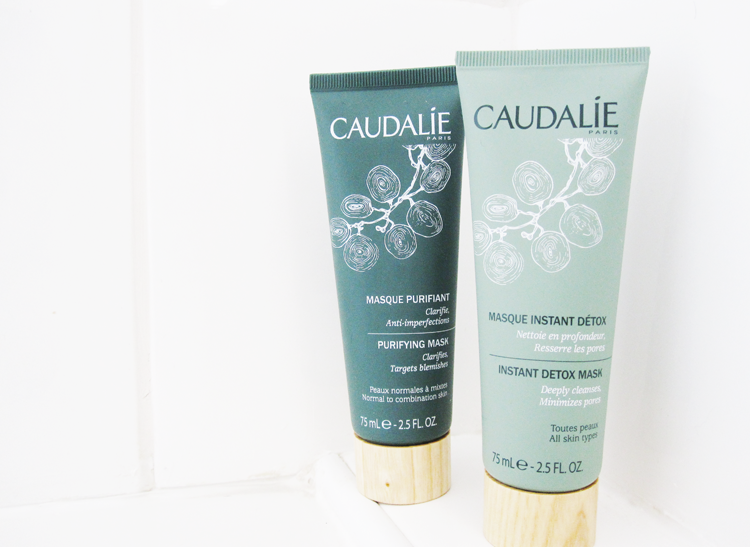 Caudalie Instant Detox Mask* (75ml, £22, link) - for all skin types. I always find clay masks to be very effective for when my skin is playing up and this one from Caudalie is quite frankly brilliant stuff. Formulated with a 99.3% natural clay composition, it uses the powerful properties of Pink Clay, Grape Marc Extract and Coffee to really deep clean the skin, eliminating all those pesky impurities, whilst also declogging and tightening up pores in the process. The mask itself is quite thick, but easy to apply and has a typical fresh herbal scent that I like. It gets to work in just 5-10 minutes, so perfect for when your skin needs some TLC but you're short on time. Just slap this on and before you know it, it's time to take it off! I removed it with a warm flannel and noticed that my pores were a lot smaller and less noticeable than before, and my skin overall looked brighter and felt smoother. This is a seriously good detox mask for the skin but one that does the job gently; it didn't irritate my skin or dry it out like other clay masks I've used in the past which is another bonus point in my books. Caudalie Purifying Mask* (75ml, £22, link) - for normal to oily/combination skin types. The Purifying Mask is similar to the Instant Detox Mask but primarily targets excess sebum and helps to clarify the skin, as well as working on blemishes and eliminating impurities. This one is 94% natural and has key ingredients of White Clay, Sage and Zinc Extracts which are known for their balancing and purifying properties. As my skin is generally combination, I applied this to just my t-zone area which is prone to oiliness and breakouts. The texture of this isn't as thick as the Instant Detox Mask and feels a little lighter and creamier, with a fresh natural scent to it. I left it on as directed for 10 minutes and removed it with a warm flannel. I didn't notice any immediate difference to my skin other than it feeling very clean, but the next day I did think that my t-zone was a lot less oily than it usually is. Caudalie's face masks and many more products are available from Naturisimo.com who offer free worldwide shipping. Use the code TREAT to get 10% off your order - enjoy! Have you tried the new Caudalie masks yet? This looks and sounds lovely, will have to give it a try! I haven't tried any of their masks yet but they sound great and would love to try them. I think they would be great for my combination skin.